There are many lovely beaches near Edinburgh for you to explore during your stay with us. Here are a few of our favourites. A popular beach, just 15 to 20 minutes on the bus from the city centre. Portobello provides a traditional British seaside day out. Head to the arcade for some games, watch the kids in the play park, then why not have some fish and chips in one of the many cafes or pubs? Finish it off with an ice cream on the beach! Around a 25-minute drive or 40 minutes by bus, a trip to this pretty little fishing village is a great day out. There's a wide promenade at Cramond, popular with walkers and cyclists. And when the tide is out, you can walk across to Cramond Island for a picnic and some wildlife-spotting. But please check the safe crossing times before you go, and come back before the tide is due to come in. Otherwise you might get stranded! One of the most picturesque beaches around, Yellowcraigs is about a 45 minute drive from Edinburgh, between Gullane and North Berwick. Best reached by car, there's a large car park, facilities and a play park for kids. The beach is absolutely gorgeous, a beautiful sandy cove with fantastic views across to the lighthouse on Fidra Island (said to be the inspiration to Robert Louis Stevensons 'Treasure Island'). Over the bridge in Fife, are the pretty beaches of Aberdour. Silversands is most widely known, a blue flag beach with cafe, bouncy castle (in summer) and play park. We love Blacksands, beside Silversands, next to the harbour, with lots of rocks to explore. Both beaches offer fantastic views across to Edinburgh. 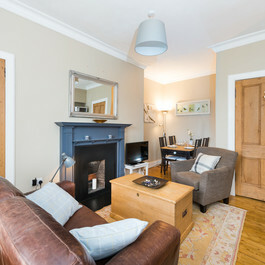 Aberdour is 30 minutes by train or car. 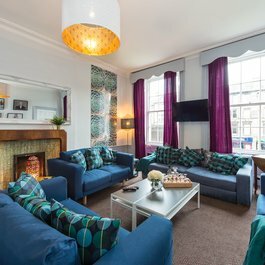 Our self-catering holiday homes in Edinburgh are the perfect base for your Scottish summer holidays. 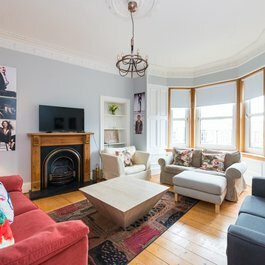 Take a look at our beautiful rental properties and please get in touch if you need help choosing the right one for you. And if you have any questions about visiting these fantastic beaches near Edinburgh, we're always on hand with help and advice.